SHD Tech Points in Division 2 are crucial for unlocking new skills and perks, and can only be found in Division 2 SHD Tech Caches, which you can either find around the map or as rewards for certain activities. Needless to say, people have been doing everything they can to find as many as possible. However, some agents have been agonizing about finding all Division 2 SHD Tech Cache locations. Some are missing a couple, while others are lacking just one. It can be pretty frustrating. Our Division 2 Missing SHD Tech Points – Where to Find guide aims to show you the locations of SHD Tech Caches that you might have missed. This include unmarked caches around the White House, in Downtown West, and West Potomac Park, as well as SHD Caches you get as rewards from side missions and end-game activities. There are four unmarked SHD Tech Cache locations squirreled away around the White House area. One is on top of a small building, west of the White House, on the corner of 17th St NW and South Lawn Road. Another is south of the White House, near the corner of 16 St NW and Ellipse RD NW (the one that goes in a large circle). The third one can be found on the block between 17th St NW and Jackson Pl NW. Lastly, one Cache is on a building just off the corner of 16th St NW and H St NW, north and a little to the east of the White House (credit to Reddit user FoehammersRvng for their findings). Where to Find Downtown West SHD Caches in Division 2? To find the SHD Caches in Downtown West, your best bet is to find the laptop in the Campus Settlement. This will help you mark the five Downtown West SHD Tech caches. There is, however, another issue here. One of these caches ends up locked behind the Worksite Community mission. If you’ve missed it, your only hope of getting it is to find a bounty that will grant you access back into the construction site. The others, fortunately, are not that big of a problem. Check out our Downtown West SHD Tech Caches – 5 Unmarked Locations for more details. Division 2 West Potomac Park SHD Tech Cache Near Washington Monument – How to Get? To get the SHD cache in West Potomac Park, the one near the Washington Monument, you’ll have to unlock the door in the center of the skid row-like area. I’m talking about that stretch of land that’s full of RVs and ramshackle houses made of planks, pallets, and plastic. The issue is that this requires you to go through a door that’s locked from the other side. Fortunately, you can shoot the padlock from the other side. Finding a clean shot, though, that’s a different story. 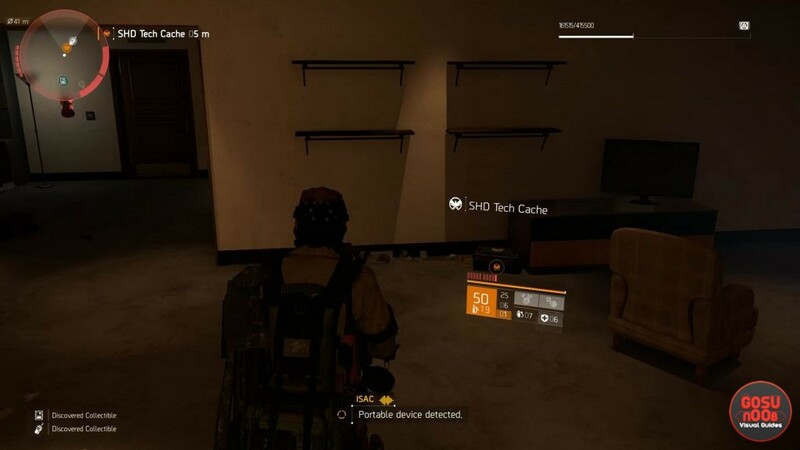 Take a look at our How to Unlock SHD Tech Cache Near Washington Monument article for further instructions. There is one side mission that unlocks after you’ve reached Level 30 and completed the last Stronghold to unlock World Tier 1 and Specializations that rewards you with five Caches. This mission is called Rayburn House, and you can pick it up near the corner of 1 St SW and C St SW, south of Capitol Hill. There’s also a follow-up mission, which nets you a further five SHD Caches. Also, completing World Tiers is going to reward you with even more SHD Caches, so rest assured; as long as you complete everything the game has to offer, you’ll have more than enough Tech Points.